This replica stupa was built to fulfill His Holiness Somdet Phra Nyanasamvara’s desire to have a commemorative structure constructed for the Lord Buddha in this monastery. M.R.Mitrarun Kasemsri’s design was adapted from the original Buddhagaya Chedi in India. The replica Buddhagaya Chedi is a symmetrically square structure with a width of 22.50 meters on all sides. 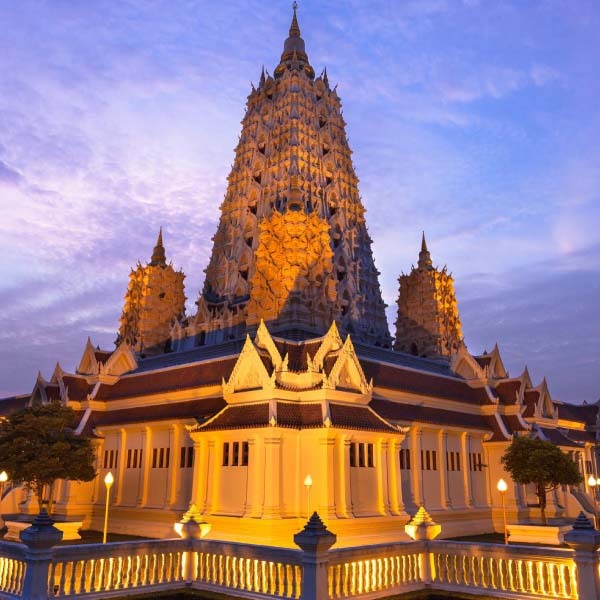 It is enclosed by Phra Rabieng (cloisters) and Kampaengkaew (boundary walls) and surrounded by flower gardens of geometrical patterns. The principal stupa is seven-storey tall with a floor-to-floor height of 3 meters and a width of 12 meters across the base. If the two levels at the stupa’s base are included, the stupa will be nine-storey tall. There is a spiral stairway leading to the top floor. A permanent exhibition on the topic of ‘What did Buddha discover from his enlightenment?’ is displayed along the exterior veranda and the interior walls of the principal stupa on the ground level.